A mild chicken larb with crushed roasted rice, flecks of roasted chilli powder, slivers of onion, Kaffir lime leaves and chopped coriander, all bound together with a intensely sour and salty dressing. Healthy and Delicious with a bowl of rice. As umami heavy as Laotian food is, it's equally light on sweet flavors. There's a saying in Laos that "sweet makes you dizzy; bitter makes you healthy." 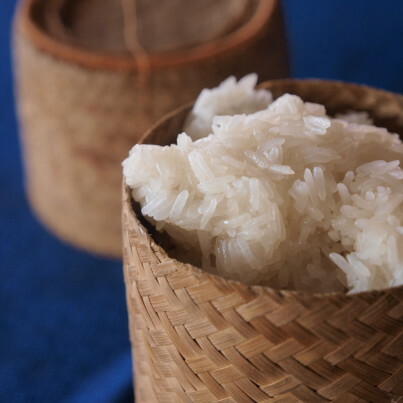 Sweet treats generally come in the form of fresh fruit and, you might have guessed it, sweet sticky rice. The sweet and sour flavor combinations you'll find in other Asian cuisines, however, aren't common in Laos. Typical dishes include laap (or larb), which is a salad of any kind of minced meat;mok pa, which is fish steamed in a banana leaf; grilled chicken, pork or fish; andjaew, which are dips that might be made from roasted eggplant or tomatoes. Undertones of lemongrass, chilies and galangal, a root in the ginger family, are everywhere, imparting spicy and sour notes that bring awesome heat and layers to dishes. Meals tend to come with a whole slew of condiments and dips, and unless you're eating noodles or noodle soups with chopsticks, you're probably eating with your hands, scooping food up with sticky rice. So why isn't Laotian food as well known as Thai, Vietnamese or even Cambodian food? The answer is neither simple nor straightforward. It's a story of migration, within Asia and also outside of the continent. Laos and northeastern Thailand were once part of the same country, and their shared culinary heritage is still visible today. 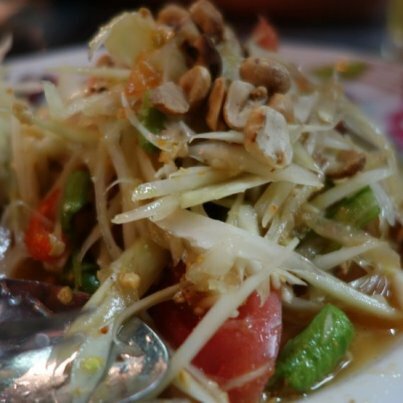 While laap, the minced meat salad, is a Laotian dish, for example, it's also a staple in the northern part of Thailand today. Laotian culinary influence disseminated through Thailand and Laos' other neighboring countries just as Thai, Vietnamese, Cambodian and even Chinese ingredients and techniques have come to Laos over the years. It's difficult to tease apart what is actually "authentic Lao," and like any national cuisine, there are regional and even individual styles and preferences. In an article for Medium in which Schwader credited the "regional proximity" of Thailand, Laos and Vietnam for the "undeniable similarities," in their cuisine, including "their styles of cooking... many of the same ingredients and traditional preparation methods," he described the difficulty of isolating distinguishing factors among the countries. They're deeper down, at a personal level. "My family, for example, will probably never reach a consensus about whether or not beef jerky should be made with oyster sauce," Schwader wrote. Not only are the cuisines of Southeast Asia so intertwined, making it difficult for an outsider with a rudimentary understanding of the region to distinguish them, but Laotian food has not been marketed as heavily as Thai or Vietnamese, at least in the United States. As Thai food spread around the globe, it became more recognizable to call dishes that were originally from Laos, like sticky rice or laap, Thai as opposed to Laotian. It's not just Thai and American people labeling these dishes Thai, either. Even some Laotian immigrants opening restaurants in the United States may have called their restaurants Thai in hopes of attracting more Americans, Schwader confirmed. Furthermore, because of the culinary closeness between the countries, it's not entirely incorrect to call laap Thai, for example. If the laap has padaek, however, that's a different story. With Northern Thai food becoming more popular in the West, thanks in no small part to the wildly, and deservedly so, popular Pok Pok restaurants, westerners are discovering there's a lot more to Thai food than just pad thai. The cooking techniques and flavors that Northern Thai food shares with Laotian should prime diners' palates for Laotian cuisine. With chefs like Schwader, whose passion for Laotian food and people is evident within five minutes of talking to him, cooking up incredible Laotian food in acclaimed restaurants, the ascent of Laotian food seems inevitable. If you're curious to try making your own Laotian food, Schwader suggests starting with laap, which could be as easy as mincing your meat, poultry or fish of choice and mixing it with herbs and lime juice. See here for a chicken laap recipe from Epicurious, and check out the food blog Padaek for more recipes. If you live in New York City, Bangkok Center Grocery on Mosco Street in Chinatown carries a lot of Laotian ingredients, or try your local Asian grocery store. Once you start tasting the glory of Laotian food, you'll never look back. Map of Laos before 1893. 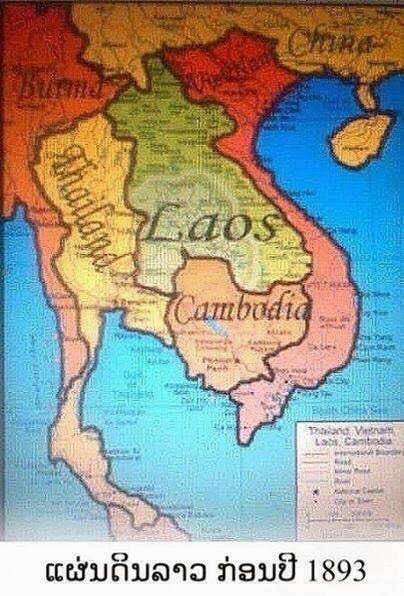 In 1893, The Siamese (Thai) agreed with the Rothschild puppets to cede Laos to France, significantly expanding French Indochina. In 1896, France signed a treaty with Britain defining the border between Laos and British territory (Thailand). The Kingdom of Laos lost a huge part of their land and became a protectorate, initially placed under the Governor General of Indochina in Hanoi. The French were under Marie François Sadi Carnot, the fourth president of the Rothschild frère Third French Republic and The British were of course under another control of the Rothschild brother. French and British Rothschild both had strong interests in controlling parts of Indochina by divide and conquer like any other parts of the world. Twice in the 1890s, they were on the verge of war over two different routes leading to Yunnan. But several difficulties discouraged them from war. The geography of the land made troop movements difficult, making warfare more costly and less effective. Both countries were fighting a difficult conflict within their respective countries. Malaria was common and deadly. Ultimately, the imagined trade routes never really came into use. In 1904, the French and the British put aside their many differences with the "Entente Cordiale", ending this dispute in southern Asia.